The Black Bomberman has attacked a city, stealing the seven power circuits that provide it with electricity and scattering them across several planets. The city is completely disabled and is in great fear. It is up to White Bomberman to recover them. The gameplay consists of the same basic structure as the previous games in the series. 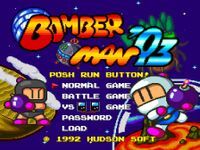 The player controls Bomberman by moving him around block filled mazes and laying down bombs. The bombs erupt into a cross-shaped explosion several seconds after being set. The explosion can destroy any blocks or enemies in its path, as well as Bomberman himself. If the explosion touches another bomb, the second bomb will instantly explode as well. This basic formula is used in both the single player and multi-player modes. Source: Wikipedia, Bomberman '93, available under the CC-BY-SA License.